It’s been one year since the World Health Assembly (WHA) adopted Resolution 69.9—a call for countries to implement the World Health Organization’s (WHO) Guidance on Ending the Inappropriate Promotion of Foods for Infants and Young Children to further protect breastfeeding, prevent obesity and chronic disease, and promote a healthy diet. Together with the International Code of Marketing of Breast-milk Substitutes (the Code), the guidance safeguards families and caregivers against misleading information that undermines optimal infant and young child feeding practices. Clarifying that “follow-up formula” and “growing-up milks” fall under the scope of the Code and should not be promoted. Stating that messages on complementary foods should always include a statement on the need for breastfeeding to continue through two years and that complementary foods should not be fed before six months. Saying that labels and designs on complementary foods need to be distinct from those used on breastmilk substitutes to avoid cross-promotion. Recognizing that any donations to the health care system (including health workers and professional associations) from companies marketing BMS and foods for infants and young children represent a conflict of interest and should not be allowed. Emphasizing that sponsorship of meetings of health professionals and scientific meetings by companies selling BMS and foods for infants and young children should not be allowed. Thailand recently passed the ‘Control of Marketing of Infant and Young Child Food Act,’ which regulates the “extensive and often misleading industry marketing of breastmilk substitutes.”  The act prohibits marketing and advertising of BMS for up to 12 months, and only permits supervised promotions, in compliance with the National Committee in Controlling Breastmilk Substitute Marketing, for 12 to 36 months. Indonesia is conducting a review and revising its ‘Food Label & Advertising Regulation.’ The draft is expected to increase the age of BMS advertising from the current scope of only 12 months of age, and incorporate other recommendations from the guidance. In Senegal, an Ad Hoc Committee set up by the Health General Director, to Revise the Inter-Ministerial Decree on Marketing of Breastmilk Substitutes is in the process of submitting a developed decree on Marketing of Infant and Young Children Foods. The decree incorporates Code provisions as well as recommendations from the WHO guidance. Many more countries are actively working to strengthen the implementation of the International Code of Marketing of Breast-milk Substitutes within their national context. But with only one year to go before Member States must report on their progress to the World Health Assembly, countries must accelerate action to adopt the new guidance into national law, establish a system for monitoring and enforcement, and continue to strengthen the protection of breastfeeding and prevent the inappropriate promotion of foods for infants and young children. Failing to take action will put mothers and children at risk, and undermine progress towards improving child nutrition and health around the world. This blog, by Helen Keller International’s (HKI) Assessment & Research on Child Feeding (ARCH) project, reflects on the WHO Guidance as the 2017 World Breastfeeding Week approaches in coming days. 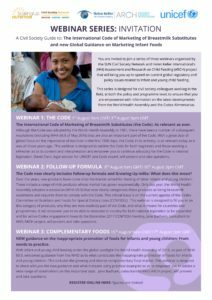 In this regard, HKI’s ARCH Project is partnering with the SUN Civil Society Network to hold a series of three webinars to bring the global community up to speed on current global regulatory and policy issues related to infant and young child feeding.